Joined: Oct 02, 2006 Posts: 150 Location: at your mothers house, she says "Hi"
I've had the IFLY 747-400 for a while now, but not spent much time with it. I'd installed it, got sick of poor fps, uninstalled it, reinstalled it....you get the idea. I can't really figure out how I'm meant to program the flight data and just exactly what the purpose of it is. I can fly an IFR flight plan, capture the ILS, nail the approach and put the beast right on the pad everytime. What does all the programming offer me? I've read the 332 page PDF manual, and while it talks about the unit, I can't find any reference as to the actual use of it. Does anyone have any good links for info? I really wish i could help on this one, but i have the same problem with this (frame rates that is), which is a shame because it really is a nice model! I think what we're basically dealing with is the programming of the FMC. Most of them work on the same principles, meaning if you've mastered one, you shouldn't have any problems using the FMC in another aircraft. The good news is that you're looking at iFLY's FMC - my favorite one because it's big and you can actually read what it says on the buttons. The bad news is that the PDF included in the iFLY is a bit chaotic in the layout and doesn't lend itself for studying how to use the FMC. Use the iFLY FMC for learning, you won't need binoculars. Here are two different manuals that should help you on your way. This one was written for the PMDG and deals not only with the FMC but it is very good (the FMC procedures are the same) and the illustrations are very clear. This one I find a bit harder to read due to it's format, but it is excellent. There are many more tutorials around if you look, I suggested those two because I have found them very helpful. Again, as far as the FMC is concerned, don't bother wading through the iFLY PDF. Just remembered that there are 2 SPs for the iFly plus some other goodies on this page. Regarding frames, she's a bit heavy, no matter where you fly but I find relief by not selecting VC and Cabin. Thanks for the references, I'll chase them up. I have both sp1 & 2. I overcame the frame rate issue with some fresh hardware. Now capable of 60+ fps with 100% traffic and detailed clouds (though I lock it at 24), all sliders topped out. To be honest, I prefer the 737-experience for a "jump in and fly somewhere" aircraft. But the Ifly is definately a more realistic experience. It "feels" a whole heap heavier than any other aircraft I flown in FS. It takes a lot of commitment to get pass the 1970's red carpet. I would like to know if there is a way to fix that, because the iFly B747-400 is the best freeware I've ever used, and I'd like to take that to FSX. I'm assuming that you haven't changed your OS from XP to Vista since the time you had iFLY installed in fs9, because there could be an issue according to the Readme file. I just tried to run the .exe of the Base pack with the intention to target a Temporary folder and then install manually into FSX to troubleshoot. Problem is, the InstallShield Wizard only gives me the following three options: Modify - Repair - Remove. It won't let me browse to a folder of my choice to install again. I'm assuming this happens because the InstallShield Wizard detects that iFly is already installed on my system. Obviously I don't want to execute either of those options because I've got the whole lot installed. Even if I went through that rigmarole, I'd still have no guarantee that during a fresh install I'd be given a choice. In your case however, if you no longer have fs9 installed it might be worth a try - you certainly wouldn't be losing anything. I would uninstall EVERYTHING that is part of iFly, then delete any left-overs and start over again. This time of course I would try to override the destination that the .exe has in mind, which is fs9. Even if it's possible to change the target to FSX instead, I wouldn't do that, because you'd probably end up with the same problem you have now. Instead, as mentioned above, I'd try and force the installation into a temporary folder. If it works, it shouldn't be too difficult to move the bits and pieces where they belong in FSX. And I don't think I'll upgrade to Vista for a while, Not until Microsoft offers compatibility for every single (and I mean all of it) piece of software that I use....Guess I'll just wait until they release xpSP3. P. S. When I first ran the iFly .exe on this computer, I told the installer to extract the files into a temp folder, Because I know about the Fs9 and FSX folder problem. So it boils down to this - if I understand you correctly, that is. You managed to extract to a Temp folder and then moved all the bits and pieces manually? 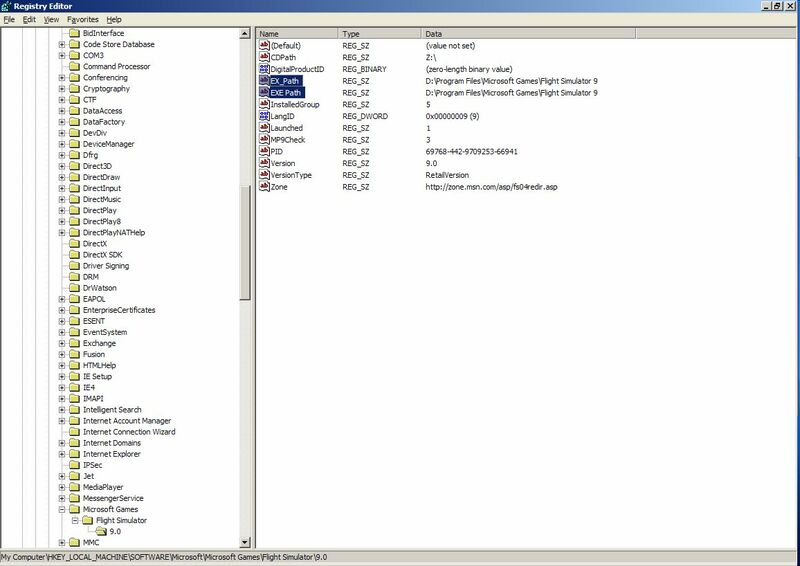 Now you're not saying, but I assume that when you installed iFly on your Laptop into fs9, you did NOT extract into a Temp folder but instaed let the .exe do its thing. If that is so... AND if you still have that installation, you should be able to compare if everything is in its right place in your fsx installation on your desktop PC. Okay. Let'sjust pretend that I never said anything about my laptop. Here I am: Fsx installation, having never installed the iFly before. I extract the iFly files to a temp folder. I move those bits and pieces to the correct FSX placement. I load up the iFly, then BOOM. I get blasted away with that error message. Well, assuming that you did indeed put everything in it's proper place - we all make mistakes - there is still the Registry issue. If I knew how to outsmart that InstallShield Wizard, I'd love to extract to a temp folder and give it a try. But as mentioned previously, it seems to detect my installation and doesn't offer me the option of browsing to a folder of my choice. Modifying (placing extra underscores in the key values etc.) the relevant entries in your registry concerning FS9 ought to do the trick...but I wonder what that installer would do if it cannot find FS9 on your machine. You'll just see it'll come up with a message "FS9 cannot be found, operation cancelled" or something. .but I wonder what that installer would do if it cannot find FS9 on your machine. Good point but wouldn't you think that the installer would prompt me to browse in that case? I don't know about you Ardjan but I've got my sim in the default location i.e. Program Files. I've recently become aware that many simmers install fs9 straight into the Local Disk main directory in order to AVOID the Program Files directory. In a case like this, an unsophisticated installer wouldn't be able to find fs9 either... am I making sense? So how are those guys getting around it? I'm gonna have to do a little bit of research; don't have the details of it in memory I am afraid, I will write up something about this, but you're gonna have to bear with me a little bit as I don't have a lot of spare time today. Re. point 2, an unsophisticated installer, i.e. one that would assume a program is installed in it's default location would indeed not get around this. If it did not have a browse option, I imagine it would simply create the folders that it would expect to find, and dump the package in there, which would be of zero use to the end-user. In theory, ( ) The key we're looking for is the bottom one of the two highlighted in the screenshot below. Then double-click the newly created key to enter the value for it, in my case "D:\Program Files\Micro....." etc.etc. The restoration-process will be clear to you I presume...? Actually I was referring to the guys who install FS into "Local Disk" instead of "Program Files". I consider that to be relevant because if they didn't know "how to get around it" they'd be missing out on a lot of very good add-ons. I doubt very much that anyone would even consider this to be an acceptable compromise. Anyhow, I appreciate your mini tut above and your thoughtfulness to provide a screenshot -- exactly what I was hoping for. Just gimme a couple of months to get my head around your instructions... did I say 'months'?? It must be true then. Unfortunately that wasn't the reason I was a bit short for time yesterday, I was doing some chores outside the house involving soil, weed, grass and lawnmowers. The type of things found near the bottom of my favourites-list..
Hmm, sorry. Must post again... I overlooked something: the reason why the installer gives you the M/R/R options (Modify/Repair/Remove) is not because it finds the files already present at your HD, but because it has its registry keys of its own. It just checks whether or not they are already present in your registry, if yes, it presents the M/R/R screen, if not it starts with a new installation. You need to delete the regkeys contained in this zipfile (dead link removed), once that is done, the installer will think this is the first time it runs and presents you the new install screen. Key 1 and 2 in the zipfile should be there in your registry, key 3 is optional. One "But", I don't know for sure (never really looked in to it) if the GUID used for Ifly (link) (59CDE5DC4C6480045831B38A62AE3C47) is the same in your registry. 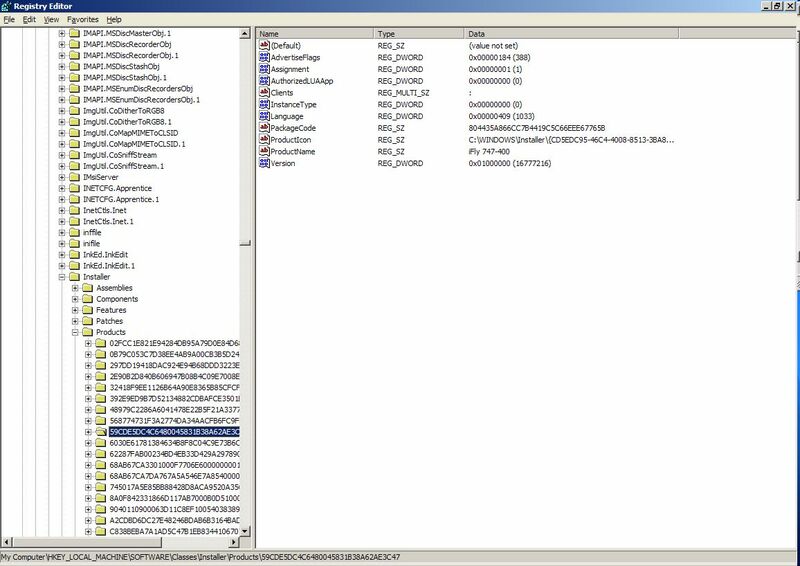 If you can't find this GUID in your registry you will have to either use the search function, or manually browse through the folder (as displayed in the screenshot, which shows key 2 from the zipfile) in which the GUID should be located to find the one you are looking for. I feel terribly rude not replying much sooner and I'll be straight with you. I have to set a few hours aside when I'm fully awake and when I won't be disturbed by anything or anyone... including myself. Don't think for a moment that your industriousness has been in vain; on the contrary this might just be my springboard for a new career such as writing a new OS from scratch. Lol - don't worry, I know like no other how life can get in the way of your spare time. One condition, I get to beta-test TailOS V1.0 Beta, or Plathook V1.0 Beta, or whatever you're gonna call it..